Can you provide selective copper pads to enable even stronger solder joints for ZIF connectors? Yes, we can. Through a series of tests, we were able to reliably produce aluminum trace printed circuit boards with selective copper pads 5µm thick, 0.007” wide and 0.047” long. The copper pads are plated onto the aluminum producing a robust bond. Is the customer happy with the result? Yes, and we have the smiley face on his email to prove it. Can you produce an aluminum circuit board without the copper base layer? Yes. 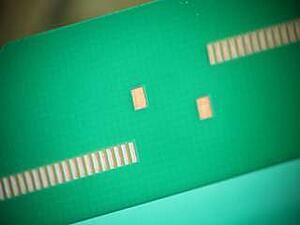 Initially aluminum trace PCBs were manufactured with a layer of copper between the aluminum and the dielectric base. As per customer requirements, we have developed an inventive process of producing a purely AL-PCB by eliminating the inner copper layer, further adding to our catalog of material options and process capabilities. Can you produce aluminum circuit boards with a dielectric which is only 50µm thick? For a variety of reasons, customers require the physical properties inherent in thinner substrates. It may be simple to quickly answer yes, we can do it; but, we needed to prove the point. The manufacturing processes had to adapt to the flexible nature of the materials which added some new challenges. The result was an aluminum circuit board with circuit performance characteristics equal to our standard offerings but is also thin as paper. Have Omni had requests for PCBs manufacturing were you had to say no to? Yes, there have been a few. For example we were recently requested to ship aluminum trace PCBs to a middle east country under severe trade embargos. We forwarded the criteria required by the federal export office and our potential customer then asked if we could provide the PCBs through an intermediary in China. Our answer was respectfully no. When we launched our aluminum trace circuit board products in July of 2013, we didn’t expect to break out the cookie cutters and start shipping the same board just in different profiles. What we hadn’t anticipated was just how diverse and exotic the applications were for our AL-PCBs. When a customer provides a challenge which exceeds the scope of our AL-PCB design guide, the excitement to develop the solution is infectious and as the benefits to the customer become better understood, so does our desire to help.